Cool. 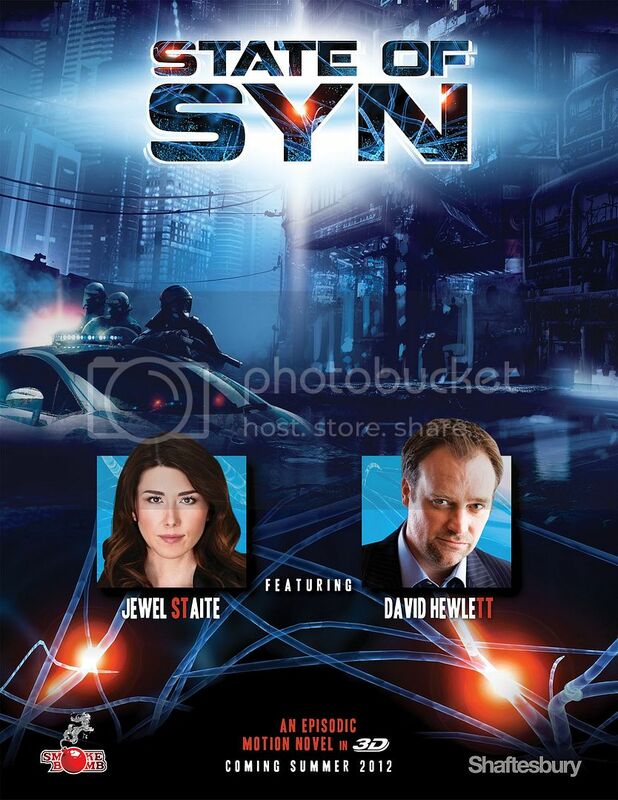 New series/novel/whatever with David Hewlett, Jewel Staite and Rainbow Sun Francks! TORONTO/CANNES, March 28, 2012 /CNW/ - Shaftesbury and its award-winning digital media division, Smokebomb Entertainment, today announced casting and production details for State of Syn, a groundbreaking science fiction digital project. Starring Jewel Staite (Firefly, LA Complex), David Hewlett (Stargate SG-1, Stargate: Atlantis), and Rainbow Sun Francks (The Listener, Stargate: Atlantis), State of Syn (10 x five minutes) is a 3D-enabled digital motion novel for online, smartphone and tablet devices that combines live-action photography with animated hyper-real backgrounds. Commencing production in Toronto in early April, State of Syn will launch to consumers in summer 2012 and will also be offered to buyers as a standalone property for multiple platforms at MIPTV 2012 in Cannes. "State of Syn combines the best of traditional sci-fi storytelling with the type of immersive user experience that only digital platforms can offer," said Daniel Dales, CEO and Executive Producer, Smokebomb Entertainment. "Fans of the genre will experience a thrilling mystery presented in an eye-popping layered animation style with interactive elements that will deepen the story world." Featuring 10 five-minute narrative episodes, State of Syn takes place in a futuristic society where instability reigns but one commodity remains accessible to all: technology. The storyline follows Annika Drake (Staite) and her friends who, following the unexplained death of her father, are pulled into a twisted mystery surrounding his former company, emerging tech giant Psylosense. Now run by her father's former business partner Aslin Kane (Hewlett), Psylosense is manufacturing a highly addictive new sensory experience called Vibe - a digital technology simulating a neurological condition called synesthesia - which is poised to become the new opiate of the masses. Audiences will be able to enhance their experience of the narrative through an interactive content layer that will allow additional story information to be revealed upon demand via text, audio or images throughout each episode. They can also choose to view State of Syn in 3D through the use of a 3Dee Slide (available for purchase from 3DeeCentral), or on any 3D-enabled device.